Include the Air compressor swash plate, Sintered Bearings, Steel Sleeves,Spherical Bearings and Solid Bronze Alloy Bearings. The bearing is specially designed for the automotive steering system. 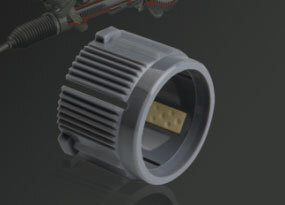 The designation is with the advantages of combining high elastic material and high wear resistance material CSB-EPB7. This perfect design provides the solution of ensuring both elastic resistance duration and wear resistance could be guaranteed. The rotation parts of CSB-PEC series rotary chain are self-lubricated plastic bearings. 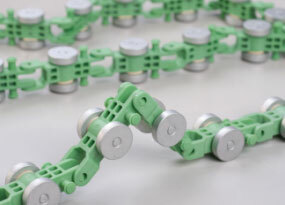 The material CSB-EPB15 used in the plastic bearings provide maintenance free feature of the chain system. With the anti-dust and anti-corrosion features of this bearing material, the chain system could be free to operate under critical conditions. Comparing with the traditional rolling bearing design, the long term stable operation with low noise design of PEC chain prevent the chain system from stuck and operation failure. The metal parts of the PEC chain are specially treated for the long term outdoor operation also. Steel backed with Aluminum/Tin/Copper bearing layer. This 0.2-0.5mm thick layer is with the hardness of HB30-50, provides excellent Anti-seizing property, good embedding capability and adaptability. 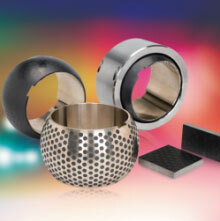 This type material is suited for application in engines from low to medium loads. 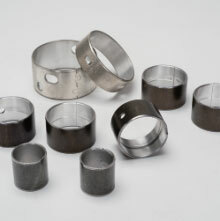 The hardened steel bearings are made of C45 steel or 100Cr6 steel. These parts are for heavy duty application on the construction engineering machineries. 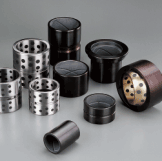 For better performance, the hardening of the bushing could be treated with normal hardening process or special QPQ process to achieve an excellent hardness requirement and lubricating characteristics. 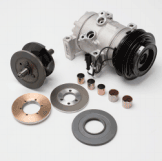 The swash plate is a special part used in the vehicle air conditioner compressor. The basic material could be bronze alloy sintered onto steel back or a special polymer coating on the steel plate. Full bronze version is also available for particular application.